In the land of fire and ice, one can expect a landscape of rugged mountains and swirling seas that will leave nature enthusiasts breathless. Discover a resilient and independent culture, descendants who escaped mediaeval Scandinavia and who defied all odds to survive in a harsh environment yet are known the world over as a hospitable people. Find a land that feels far from everywhere yet leaves each visitor with a warm memory of a sublimely beautiful landscape. Many consider Iceland to be one of the world's most visually stunning countries. Our Iceland group tours move at a fast pace, trying to best capture the waterfalls, black sand beaches, hot springs, and rugged mountains that feature in nearly every postcard perfect scene. Join us as we take on the Golden Circle Route, and along the way find vast areas of fjords, glaciers, volcanoes with lava fields and more waterfalls than one could count. Our Iceland group tours start in Reykjavik, a walkable capital that happens to be one of the youngest capitals in Europe after only being established in the 19th century. Iceland is also the last country in Europe to be settled, with nearly half of its inhabitants residing in or around the capital. Between museum visits and seafront walks, the link between Iceland and Nordic cultures is easily visible. 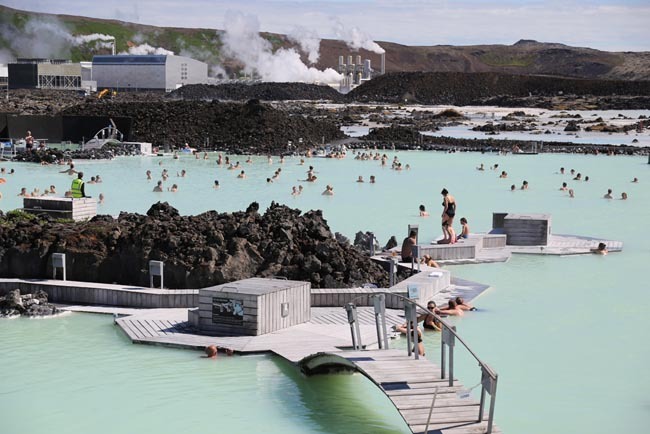 The capital also provides an excellent introduction to the hot springs around the island with a visit to the Blue Lagoon. It is the largest glacier in Iceland and is located in the southeast of the country. At 8,100 square kilometres it is the second largest glacier in Europe and the average thickness of the ice is an incredible 400m. We will board a boat to discover the breathtaking Jokulsarlon Glacial Lagoon also known as the birthplace of icebergs. In terms of fire, volcanic action has shaped and continues to shape Iceland into the dramatic land it is. We will venture to the peculiar lava formations at Dimmuborgir and the pseudocraters at Skutustaair. We will also see the volcano Krafla, famous for its 'Krafla Fires,' curtains of lava fountains from a system of fissures inside the huge caldera. The combination of the two natural features of fire and ice is best discovered in places such as the East Fjords. This stunning mountain region has been sculpted as much by glaciers as volcanic activity. On the Snaefellsnes Peninsula, the landscape is a gallery of strange and beautiful lava formations, the skies are filled with birds, and the sea is alive with marine life. 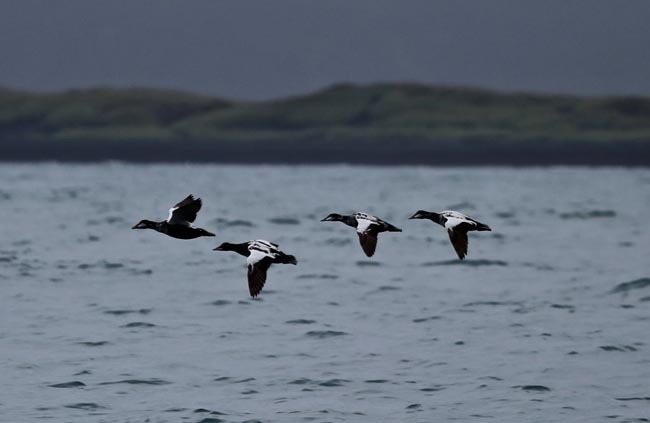 The abundance of marine life is what allowed settlement to thrive in this near-Arctic country. Small fishing villages still dot the landscape, and a trip to Iceland is not complete without a whale-watching trip to spy the Minke whales, humpbacks or even the giant blue whale. Many come to Iceland for the scenery, fall in love with the culture and dream of returning again and again. Find out why on one of our Iceland group tours. We enjoyed the the National Museum of Icland, jeep glacier tour, the video at the site of the Eyjafjallajokull volcanic eruption, the boatride on the glacial lagoon, Myvatn Nature baths, Viking House tour, fermented shark museum, etc. Sigrud, our local guide throughout the trip was knowledgeable and was very receptive to questions. We had a skilled bus driver. Food was always wonderful because Laura sought out interesting places and menus. Our tour leader was Laura was the best. I would gladly go on any tour with her. She makes the experience fun and knowledgeable. Great tour and tour leader! The Blue Lagoon was a highlight as well as the glacier, iceberg and whale watching. I also enjoyed the off the road walks and the visit to the sod house. All local guides were very good and provided much info about the culture and history of Iceland. All evening meals were delicious and reflected the local cuisine. Iceland is an amazing country and our tour lived up to all of our expectations. We love small group tours and the chance to experience interesting activities. I enjoyed all the excursions on this tour. I thought the local guide Sigrun was very good. She gave good presentations and responded to peoples questions. The bus was comfortable and the driver did a good job. The evening meals were very good and exceeded my expectations. There was lots of variety and we got to try a number of local dishes. Our tour leader Laura was enthusiastic about the tour and helpful.. A very enjoyable tour. Every thing was excellent. We saw so much that you wouldn't see without a guide. Iceland was beyond my expectations. Such a beautiful country and lovely people . Our guide was exceptional and lots of fun. We couldn't have had better weather which helped the overall enjoyment. The travel gods were surely with our group and there always seem to be an unexpected highlight as was the sheep herding and watching them being loaded to various vehicles. I enjoyed all of the excursions on this tour. Very good transportation and Roman was a good driver. Great to have a bus with more seats than people. The meal plan met my expectations. I know that our tour leader Laura is interested in food so expected the standard to be high and it was. It was a great trip. Wonderful country, great itinerary, good quality hotels and excellent food. Wonderful local guide and excellent safe driver. Trip far exceeded my expectations. It was the first group tour I have done and I couldn't have been happier with my choice.Hard to pick favorite elements of the tour but the glacier tour by four wheel drive cars. The glacier lake that had interesting Ice figures in it and whale watching were outstanding.Our local guide was fantastic. He was knowledgeable but had a very droll sense of humor. I loved him and would rate him highly. I enjoyed all the excursions. The local guides were excellent, very knowledgeable. Our tour leader Laura's personality - always energetic, always smiling, always helpful. To me she has the perfect personality for the job. Excellent trip met and exceeded most expectations. Excellent and very interesting trip. Enjoyed all elements of the tour. Some that stood out were the trip to the glacier, iceberg lagoon, whale watching, volcanos, and the many awesome waterfalls. 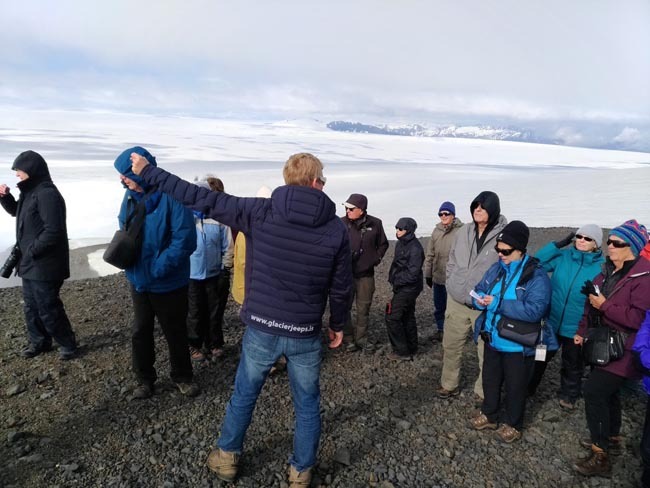 I particularly enjoyed the total scenery which was spectacular,whale watching,walking on the glacier,experiencing the power of the waterfalls,pounding surf, the lava formations,walking to the top of a volcano,a nature walk on Day7,the Icelandic Settlement Center. Our local guide was the most thoughtful and knowledgeable man, he just kept doing nice things and whatever we asked he accommodated. The transportation was totally comfortable. The meal plan exceeded expectations, dinner presentations very well done. Our tour leader was very attentive to our needs and always in good cheer, always helpful. A very good trip,the small size and compatability of the group was great. Arrival in Reykjavik. After settling into the hotel you may have free time to explore the city on your own. The first people known to have inhabited Iceland were Irish monks or hermits who came in the eighth century, but left with the arrival of the pagan Norsemen, who systematically settled Iceland in the period AD 870 - 930. Iceland was thus the last European country to be settled. Iceland is Europe's second largest island (103,000 sq. km), and the present population is approximately 320,000. 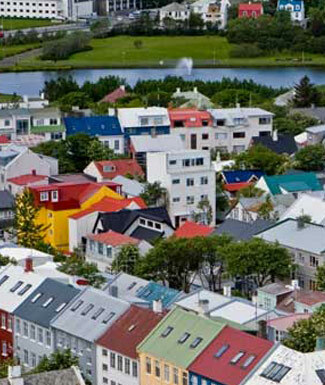 More than half of this population lives in or around the capital, Reykjavik. The rest of the population is dispersed around the coastal fringes, leaving the highland center of the country uninhabited. This morning we will enjoy a city tour of Reykjavik, the world's northernmost capital, and one of the newest, having established itself only in the late 19th century. Our sightseeing tour will include a visit to the Old town and the Old Town harbour. The Old Town is centered around the Tjornin, a small pond on whose shores, Ingolfur Arnarson, founded the original settlement in 874. It is here where both the Town Hall and Althing, or National Assembly, is located. 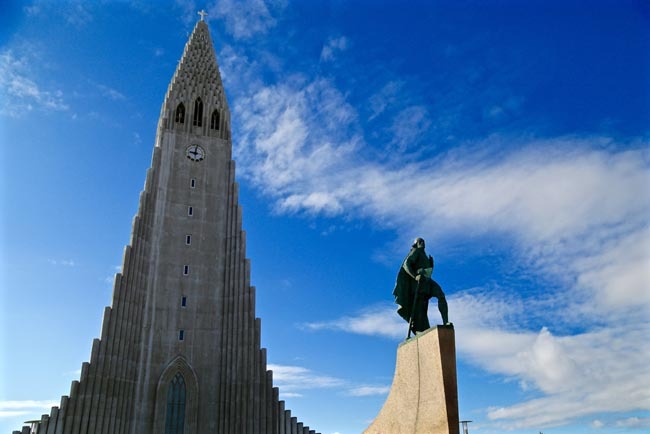 At the National Museum of Iceland we will learn about the Norse and Icelandic culture. 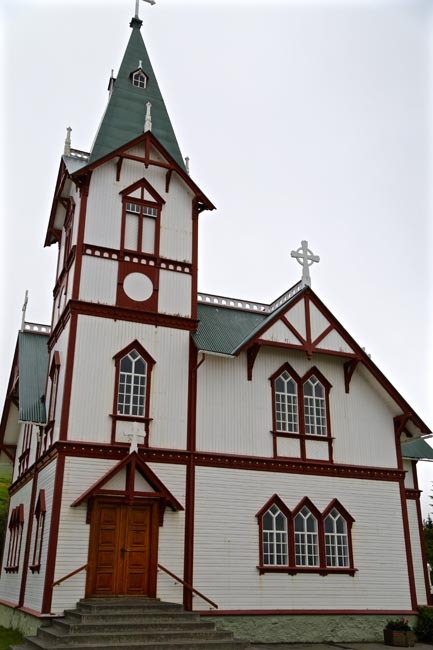 This museum houses objects of religious and folk relics, and tools dating from the period of settlement. On our tour we will enjoy a short walk along seafront, and we will also see the city Cathedral, the City Hall and the House of Parliament. We include an afternoon visit to Blue Lagoon before returning to Reykjavik for dinner. This morning we depart from Reykjavik and head towards some of the best-known natural phenomena in Iceland, a region often referred to as the Golden Circle. 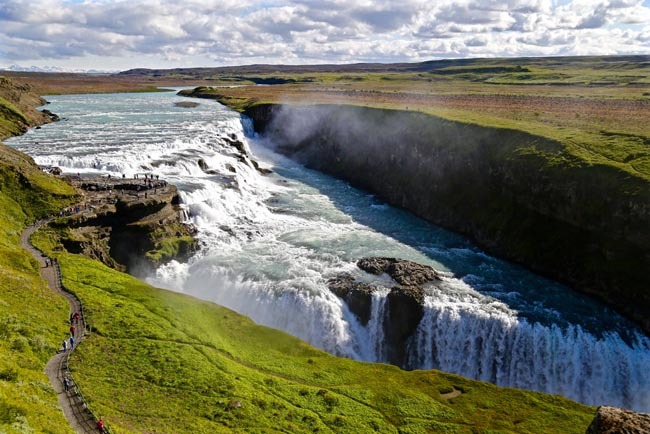 After passing through the village of Hveragerdi we will explore Gullfoss, the 'Golden Waterfall'. We then head to the nearby geothermal area spouting the hot springs of Geysir and Strokkur. This region is famous for its numerous hot springs and boiling mud pools. We then continue along the south shore past the Eyjafjallajokull* ice cap, famous for its eruption in early 2010. The glacier feeds many beautiful waterfalls and we visit two of them, stopping to admire the enchanting waterfalls of Seljalandsfoss and Skogafoss before continuing to the village of Vik nearby which we will make a short visit to the black sand beach south of Vik. * A NOTE on Icelandic place names and spelling: the written Icelandic language relies on many special characters that are not necessarily compatible with many internationally used computer programs, most notably those responsible for the text on our website. While our preference is to render local place names as accurately as possible, for the sake of clarity, we have transliterated some special characters to their closest phonetic equivalent with our apologies to our Icelandic hosts. Today we cross Eldhraun, the largest mass of lava ever to flow on the face of the earth. Our tour continues over Skeidararsandur sands to Skaftafell National Park. We continue on to the breathtaking Jokulsarlon Glacial Lagoon to see the birthplace of icebergs. We will have some time to view this stunning area before we take a boat tour on the glacial lagoon. Jokulsarlon started to form in the early 1920's and is getting bigger every year. You will see many amazing blocks of ice that have broken off Europe's biggest glacier, Vatnajokull, and sail slowly towards the ocean, which is only a kilometer away. We will also enjoy a Jeep tour on Vatnajokull Glacier. Vatnajokull, translating as "glacier of rivers", is the largest glacier in Iceland and is located in the southeast of the country. At 8100 square kilometres it is the second largest glacier in Europe and the average thickness of the ice is an incredible 400m. Under the glacier are numerous active volcanoes. Today we drive through some spectacular fjord scenery and visit charming fishing villages as we head to the capital of east Iceland, Egilsstadir. We move on to witness the towering mountains plunging vertically into the sea that form the magnificent East Fjords. This stunning mountain region has been sculpted as much by glaciers as volcanic activity. The spectacular road winds from one fjord to another, passing a few farms in each fjord where there is enough flat land for hayfields. Along our route we will make a stop at Petra's stone collection in Stodvarfjordur. The area surrounding the town is abundant with different types of rocks and minerals, and many examples of these are displayed at this museum. Today we will explore the empty vastness of the highland desert plateau Modrudalsoraefi before heading to the wonderful Jokulsargljufur Canyon National Park, visiting sites such as the most powerful waterfall in Europe, Dettifoss and the horseshoe-shaped canyon Asbyrgi. 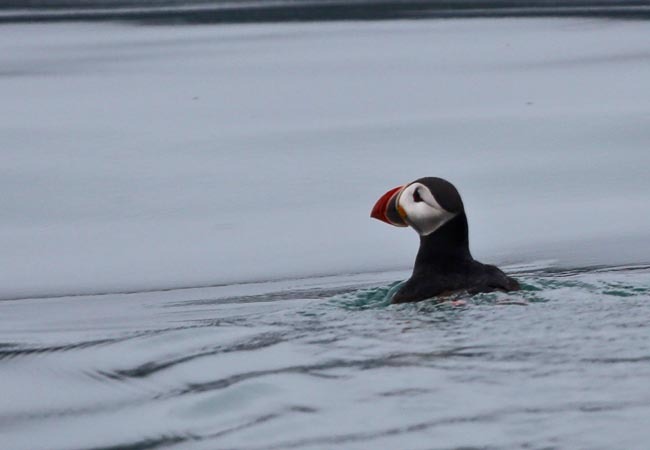 Prepare yourself to be amazed by the unique natural beauty of Husavik, the hub of northeast Iceland. A Swedish Viking, Gardar Svavarsson, first settled this charming fishing village in 870. 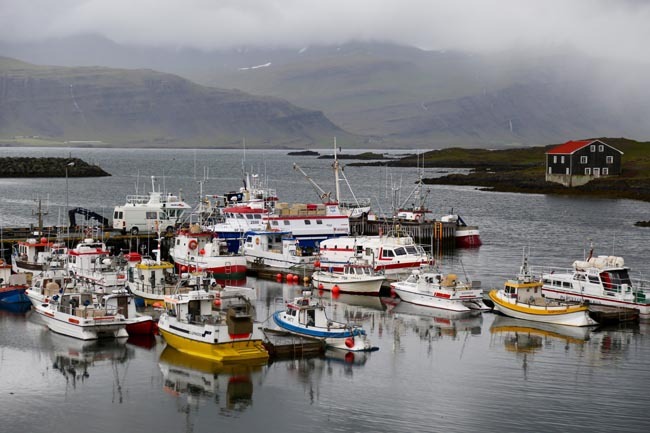 The name Husavik means "Bay of Houses" and is believed to be one of the oldest local names in the country. Today we will begin the day with a whale-watching trip from Husavik. This is a beautiful coastal town and the 'whale watching capital of Europe'. 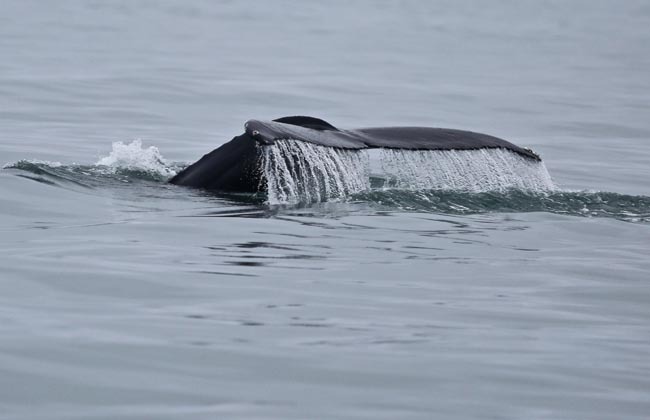 Most commonly sighted are Minke whales and white beaked dolphins, but with luck we may see others such as humpbacks and even the giant blue whale. We will also be sure to visit the local Whale Museum. Later we head towards the bustling northern port of Akureyri with a stop at the magnificent Godafoss waterfall. 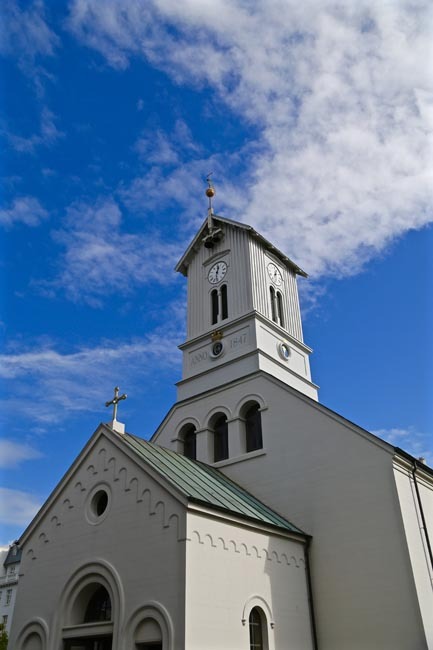 Akureyri, the 'Capital of the North', boasts some of the finest timber buildings in the country, beautifully restored to their original glory. You will have time to explore the center of this charming town with its many galleries and shops. Located 60 km south of the Arctic Circle, this is the cultural, commercial and educational centre for northern Iceland. This northerly town is remarkably green, and at some point while in the area we will visit the the northernmost botanical garden in the world. Today will be spent exploring the Lake Myvatn and its surroundings. The lake and its surrounding wetlands, created by a large basaltic lava eruption, have an exceptionally rich fauna of waterbirds. Laxa River, one of the most bountiful and sought after fishing rivers of the country, runs from Myvatn. This is an area of natural beauty, including the peculiar lava formations at Dimmuborgir and the pseudocraters at Skutustaair. Today we will also see the volcano Krafla. Krafla is one of Iceland's most spectacular and most active volcanoes. During the 1970's and 1980's, it became famous for its "Krafla Fires" -- curtains of lava fountains from a system of fissures inside the huge caldera. Today we will also visit Namaskard Pass with its boiling mud pools and vibrant colours. Nearby is the massive symmetrical crater of Hverfell. This 2500-year-old crater rises 463 meters high and is 1040 meters across. We end the day by relaxing in the Myvatn Nature Baths and enjoy bathing in a pool of geothermal water drawn from depths of up to 2500 meters. At some point while in Akureyri we will visit one of the most northern botanical gardens in the world. The aim of the botanical garden is to grow trees, shrubs and perennials in the demanding climate of Northern Iceland, which is characterized by pronounced seasonality of temperature and day length. Today we make an early start as we head out to explore the western regions of Iceland. Majestic mountains and narrow passes lead to Skagafjordur. A quarter of area residents here make their homes in the country, since Skagafjordur is one of Iceland's most prosperous agricultural regions, with widespread dairy and sheep farming in addition to the horse breeding for which the region is famed. 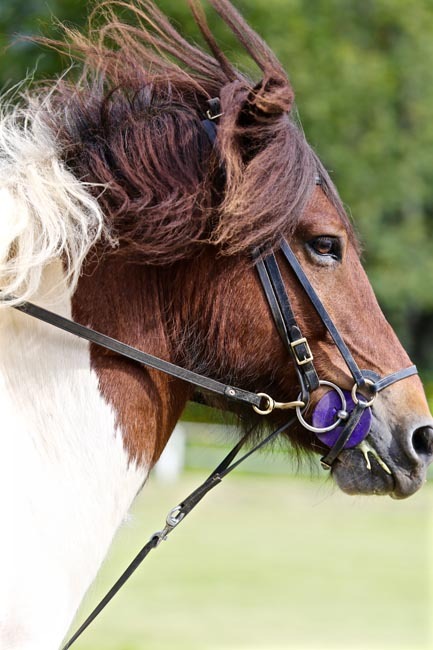 Skagafjoraur is the only county in Iceland where horses outnumber people in population. We will pass the small seaside village of Blonduos. The Blanda River, which divides the town in two parts, is one of the best rivers for salmon fishing in Iceland. Along the way we visit a reconstructed Viking house once home to Eirik the Red and his son Leif Eiriksson -- the two most famous travelling Vikings. 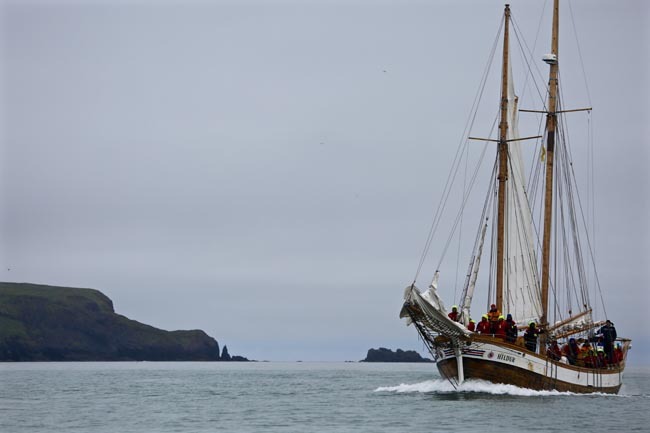 The 'Eirikstadir' gives an interesting insight to way of life for the early settlers and an introduction to the historic tradition of the 'Icelandic Sagas'. We continue to cross westward towards the Snaefellsnes Peninsula; The land around the fjord has been inhabited since the time of Icelandic settlement. Today will be spent touring the Snaefellsnes Peninsula. Our journey will take us across the north coast and out to the tip of the peninsula before crossing the southern coastline. 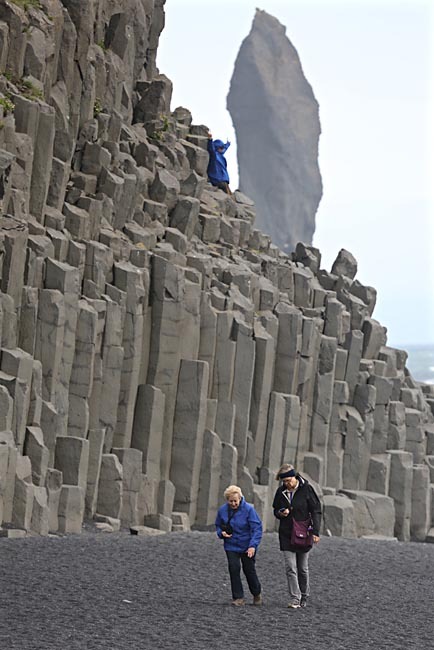 The Snaefellsnes Peninsula is a veritable heartland of history. Some of the best and most important sagas took place here, and it is said that Christopher Columbus once spent a winter in Ingjaldsholl, where he heard stories of lands to the west. The enchanting landscape of Snaefellsnes is brimming with lava caves, waterfalls and mineral hot springs. We travel here to appreciate the natural beauty, see the ocean shores, mountains, rivers and waterfalls as well as the more dramatic lava formations. The landscape is a gallery of strange and beautiful lava formations, the skies are filled with birds, and the sea is alive with marine life. We'll also visit Vatnshellir Cave, an 8,000 year old lava tube created by volcanic eruption from a nearby crater in the Purkhólar crater family. As the lava rushed down the hill in a lava river it began to cool on the surface, creating a crust on top of the lava river. As the eruption stopped, all the lava from underneath this crust continued to drain out. That eventually left behind empty tube with roof on top that gradually cooled down. We'll have a 45 minute guided tour of the cave (helmets and flashlights included), one of the most easily accessible caves in Iceland, however you need to be reasonably fit to participate (consult with your Tour Leader in advance). The charming fishing village of Grundarfjordur on the north coast of the Snaefellsnes Peninsula is set within a region justly reputed for splendid scenery and the conically shaped Kirkjufell Mountain. Our journey will take us through small fishing villages and around the west edge of Snaefellsnes to the Snaefellsjokull National Park. The landscape here is characterized by sandy beaches, rocky shoreline and jagged mountains, crowned by the mysterious shimmering cone of the Snaefellsjokull glacier. We can take some time along the route to walk along the windswept beaches. 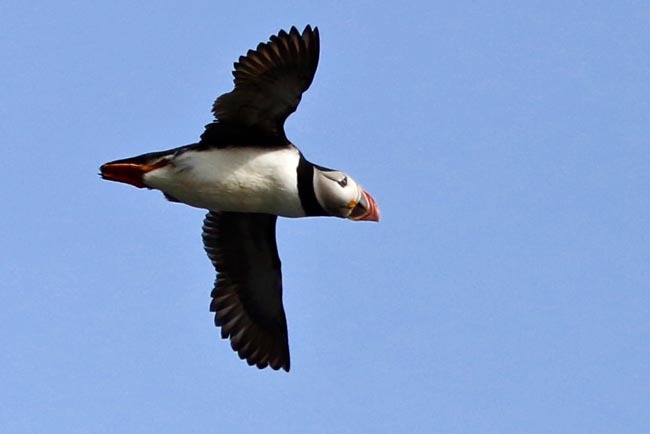 From the small fishing village of Arnarstapi with its amazing birdlife we will view Mount Stapafell, with the famous Snaefellsjokull glacier in the background. The harbour here is considered by some to be the most beautiful in Iceland. Our sightseeing today will include the Icelandic Settlement Centre exhibition at the village of Borgarnes. This visit will be followed by a drive to Deildartunguhver, the most powerful hot spring in the world. We will make a stop to admire the beautiful Hraunfossar Waterfall. This is a series of waterfalls formed by rivulets streaming over a distance of about 900 meters out of the Hallmundarhraun, a lava field which flowed from an eruption of one of the volcanoes lying under the glacier Langjokull. We then continue over the breathtaking Kaldidalur mountain pass (depending on road and weather conditions). We continue to Lake Thingvallavatn, Iceland's largest lake, and to Thingvellir National Park. The area became Iceland's first National Park in 1928 and a World Heritage area in 2004. Thingvellir World Heritage area is where the world's first 'democratic parliament' meeting took place. Geologically it is also unique as the American and European tectonic plates meet here. Sitting right on top of a major fault line, the area abounds with waterfalls, immense fissures and the largest lake in the country. 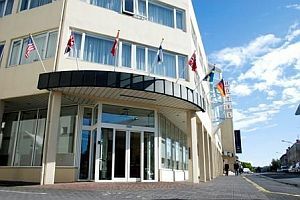 Best Western Hotel Reykjavík is a three star hotel located just a few minutes' walk from Reykjavík's main shopping street ...	most popular attractions. The neighborhood has numerous restaurants, cafés, shops, museums and art galleries. 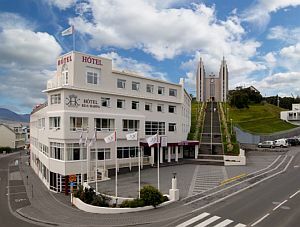 With 85 rooms, the team at Best Western Hotel Reykjavík strives to cater to the individual needs of our guests with friendly and attentive service. Situated in south-eastern Iceland, in the coastal town of Höfn, this hotel offers local cuisine and modern en-suite rooms with ...	flat-screen TV. Guests can enjoy free Wi-Fi and free private parking. All of Hotel Höfn’s guest rooms feature a work desk and cable TV access, and some also include a tea/coffee maker. Guests can enjoy glacier and sea views from most rooms. Höfn Hotel’s restaurant serves lobster and other specialities from the surrounding area. During nice weather guests can dine on the furnished terrace. 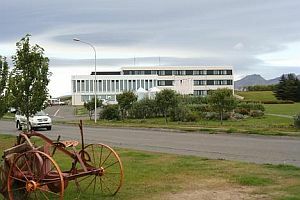 The hotel is within 10 minutes’ walk of Höfn Harbour and Silfurnes Golf Club, while the Jökulsarlón glacier lagoon is less than 1 hours’ drive away. Staff can help organise hiking trips. Located in the heart of Akureyri, gateway to the rich natural splendor of northeast Iceland, Hotel Kea has been welcoming ...	since 1944 with the same high standards of elegance, quality, service and comfort which would be expected of one of Iceland’s well-established hotels. The hotel offers four halls for meetings and conferences, bars and restaurant. Comfort, rest and relaxation come easily in all of the 104 bedrooms. They all have private bathroom, coffee and tea, making facilities hairdryer, telephone, radio and satellite television. There is room service from morning till evening and same day dry cleaning, to mention but few of the benefits of staying with us. Breakfast and dinner (local restaurants & hotels) daily. All transport, accommodation, sightseeing and entrance fees for sites noted as 'visited' in the detailed itinerary. Gratuities for driver, restaurant staff, porters (if available) Airport transfers for land & air customers arriving / departing on tour dates and for early / late arrivals who book their extra accommodation through us. International airfare to/from the tour. Tour Leader gratuities, lunches, drinks, personal items (phone, laundry, etc), international air taxes (if applicable), any excursions referenced as 'optional'. Airport transfers for Land Only customers. * Optional trip cancellation insurance. Our post-reservation trip notes offer further guidance on optional meal costs and shopping. * Beware private airport transfers in Iceland are costly. Taxis are reliable and much cheaper. The range of temperatures experienced on this tour will be WIDE. Though there will be many comfortable, summer-like days at locales visited, Iceland, as the name suggests, can still feel very wintery if you are near the sea, in a place exposed to winds, or near an icefield. July / August is mid-summer in Iceland, and daylight hours are long and temperatures are at their most comfortable. That said, summer temperatures are still on the cool-ish side, ranging from 9-14 C (48-58 F) on average, though some days could be up to 20 C+ (68-70 F) depending on aspect. Our September date will be slightly cooler, with shorter daylight hours and temperatures from 7-12 C (44-55 F), on average with some exceptions, and also depending on aspect. There is no dry season in Iceland, with precipitation spread evenly throughout the year. Land transport provided by private heated motor coach, 25-40 seats depending on ultimate group size. This is not a strenuous tour per se, but it is busy with lots of moving around, full travel days, and early starts. There are also sites that require a bit of walking in order to view the attractions (views, waterfalls etc) as they are usually located well away from parking areas. Mid-range (3*), well-located, heated, simple hotels and inns throughout. Many are smaller properties (2-3 story) and, outside of the capital, may not have elevators. All hotels have en suite toilet and bath, though some will have shower only (no tub). Porters may be available (see 'Inclusions'), though you must be prepared to manage your own luggage to and from your hotel room. Tour Leader, driver/s, local step-on guides at some locales.